When I talk about Booker T. Washington I often mention that under slavery, in most places, it was illegal to teach a slave to read and write. The majority of enslaved people lived in enforced ignorance, a fact that helps explain the extraordinary hunger for education that animated Washington himself and the men and women who contributed so much to build Rosenwald schools so their children would have more opportunities than they had had. A new children’s book evokes this terrible history with a story based on the life of someone who, before Washington was even born, was finding a way around the law. Reverend John Berry Meachum was born into slavery in Virginia 1n 1789 but, as a young man, managed to purchase his freedom and to settle in St. Louis. There he became a Baptist minister and the leader of a newly built church in whose basement he ran a school. 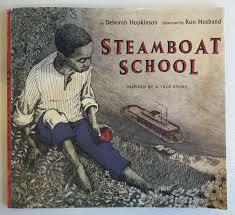 But the school was forced to close in 1847 when a new law was passed that said, “No person shall keep any school for the instruction of negroes or mulattoes, reading or writing, in this state.” Meachum’s response was to create a school beyond the reach of this dreadful law — on a steamboat that anchored in the middle of the Mississippi River. I always thought being brave was for gown-up heroes doing big, daring deeds. But Mama says that sometimes courage is just an ordinary boy like me doing a small thing, as small as picking up a pencil. Thank you, Deborah Hopkinson and Ron Husband. What a beautiful, well done book!